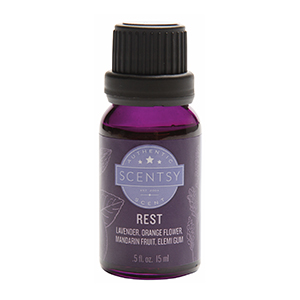 It’s time to rest and relax with our Rest Scentsy Oil. This essential oil blend will put you into a relaxing state with the calming scent of lavender and sweet orange blossom. Additional hints of mandarin and elemi help calm your mind and soften your environment. Busy minds have a hard time shutting down and now it’s time to relax with our Rest Scentsy Oil. With notes of lavender, orange blossom, mandarin and elemi to help you rest your mind and body. Simply add 10 – 15 drops of Rest Oil in your Scentsy Diffuser, and your mind take a peaceful vacation. Our Scentsy Oil fragrances are 100% Natural and derived from the most intoxicating flowers, luscious fruits and vibrant botanicals. Scentsy Oils are sourced from the finest natural ingredients from around the globe. Discover Scentsy Oils –the BEST Natural and Essential Oil fragrances that fill your mind and spirit with peace, calm, fun, energy, and harmony. Aromatherapy to help calm those nerves, release the stresses of a long day, give energy during times of low, and cause those olfactory receptors to smile. Scentsy Oils are exclusively designed to use in our beautiful Scentsy Diffusers. Experience scent in a multi-sensory way with our natural, exhilarating, and fresh Scentsy Essential Oils, 100% Natural Oils and Natural Oil Blends.